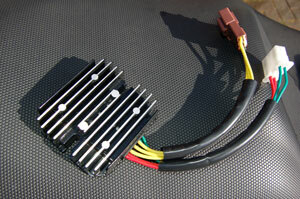 Put simply, the regulator/rectifier converts AC from the alternator into DC that the bike can use. Unfortunately, it’s not very good at it, leading to a poor charge rate. Poor charging can cause a number of problems, most commonly a difficulty starting the bike. Many Futura owners are reporting regulator/rectifier failure as their bikes hit high mileages. If you suspect poor charging, test the voltage as outlined in the charging problems page. The charge rate can be improved by either doing the Wiring Mod or by replacing the regulator/rectifier with an aftermarket unit. If the stock regulator/rectifier starts to pack up the symptoms can look a little like the bike has been possessed by a demon. The first sign of trouble can be bulbs blowing repeatedly, progressing to boiling the battery and weird electrical behaviour. If untreated it can give up altogether or worse – fry the ECU and other electrical components. As simple charging test as outlined in the charging system page will pin down the problem. In this case the charging voltage will be too high – possibly 15 or 16 volts. Replacement is the only option as the regulator/rectifier is non-repairable. Aftermarket regulator/rectifiers are available in the UK from Electrex (for about £100 delivered) or in the US from John Borella, Bikpaintr on the Apriliaforum. Other suppliers are available. Feel free to suggest one below. Note: Don’t worry about the regulator/rectifier getting hot in use. That’s normal.